Terry Bruner’s eight-year-old mare Wantagh Queen and Jose Lezcano wore down front-running favorite Questeq and Dylan Davis in deep stretch to take a six-furlong $66,000 New York-bred grass allowance by a neck in a final time of 1:08.87 on the “firm” outer turf course Friday at Aqueduct. Wantagh Queen was sent off at odds of 6-1 and Questeq was part of the 6-5 favored entry in the field of nine. Merlins Muse, who went off at 5-1 odds with Eric Cancel up, reported home third, 3 ½ lengths behind Questeq. Barrel of Destiny, sent off at 5-2 odds with Manny Franco riding, finished another half-length back in fourth. James Lamonica bred Wantagh Queen, a daughter of Utopia (JPN) out of Queen of the City by Medaglia d’Oro who is trained by David Donk. Wantagh Queen was shipping back to New York off a third-place finish in an open $16,000 grass claimer at Gulfstream Paro at 9-1 odds on March 10th. Questeq and Wantagh Queen were 1-2 the entire race. Questeq maintained a one-length lead on Wantagh Queen through a first quarter-mile in :22.54 and a half-mile in :45.07. 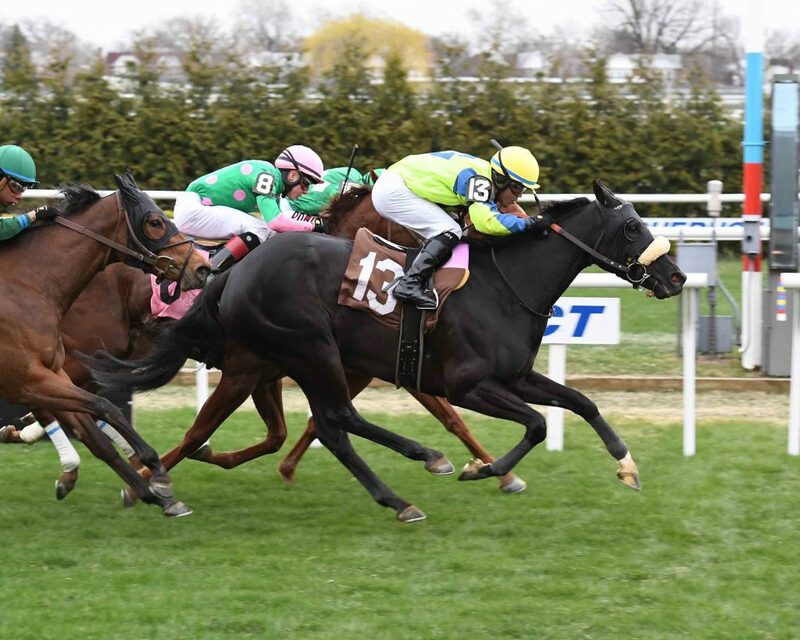 Then Wantagh Queen upped the pressure and the two hard-hitting mares duked it out head-to-head through the stretch, with Wantagh Queen edging away in the final 200 yards. Wantagh Queen is now four-for-36 on turf with three seconds and five thirds. She also has one third from 10 dirt races, for combined earnings of more than $185,000. My Purple Haze Stables’ debuting three-year-old colt Freudnme surged to the lead near the sixteenth pole and went on to a one-length victory under Dylan Davis in a 6 ½-furlong $62,000 New York-bred maiden special weight Friday. Sent off at 16-1 odds from the nine post in a field of 10, Freudnme won in a final time of 1:18.25. Bears Mafia, sent off at odds of 11-1 with Kendrick Carmouche riding, was a strong second despite a wide trip. Step to the Bank, who was adding Lasix and went off at 3-1 odds under Hector Diaz Jr., finished third, 3 ½ lengths behind Bears Mafia. There was a four-length gap back to 3-1 front-running Bassman Dave and Eric Cancel in fourth. Blue Devil Racing bred Freudnme, a son of Freud out of Nobody But Me by Trust N Luck who is trained by Chris Englehart. 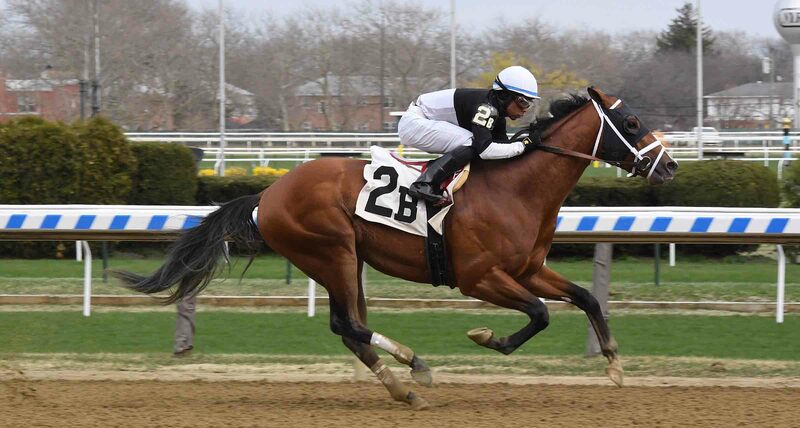 Freudnme’s final of five works for his debut was a strong five furlongs from the gate in 1:01 on the Belmont Park training track, second fastest of 35 horses working that distance the morning of March 30th. Davis settled Freudnme in fourth as Bassman Dave set the pace while chased by Step to the Bank and 6-1 Light the Posse, ridden by Chris DeCarlo, through an opening quarter-mile in :22.65 and a half-mile in :45.37. Step to the Bank, Freudnme and Bears Mafia rallied two-, three- and four-wide, respectively, around the far turn. Step to the Bank went on to take the lead as Freudnme rallied into second. Freudnme sustained his momentum and wore down Step to the Bank. Freudnme had enough left to hold off Bears Mafia. In a thrilling six-furlong $41,000 New York-bred maiden $40,000 claimer on the grass Friday, seven-pound apprentice Joey Martinez got Finest Racing Stable and Leroy Barroca’s freshened three-year-old gelding Coach Villa up in the final stride to nose Givetheman a Cigar and Dylan Davis in a final time of 1:09.83 on the outer turf course. Coach Villa, who was shedding blinkers, went off at 6-1 odds from the rail and Givetheman a Cigar was sent off at 5-2 odds in the field of 10. Front-running Velmont, who went off at odds of 5-1 under Manny Franco, finished third, a length and a half behind Givetheman a Cigar while a head in fromt of 4-1 Magnesite, who was adding blinkers with Eric Cancel up. Sean O’Conner bred Coach Villa, a son of Big Brown out of Street Magic by Street Hero who is trained by Nick Zito. Coach Villa was returning to turf off a rallying third-place finish at 7-1 odds on dirt under Martinez February 8th. Breaking from the six and seven posts, respectively, Velmont and Givetheman a Cigar got away 1-2 and remained that way through quick splits of :22.18 and :44.76. By then, Coach Villa had advanced three-wide from eighth to fourth. Givetheman a Cigar finally cleared Velmont, but couldn’t hold off Coach Villa, who just got up in a tight photo. Coach Villa is now one-for-four on turf and one-for-five on dirt with one second and one third. He has earned more than $40,000. 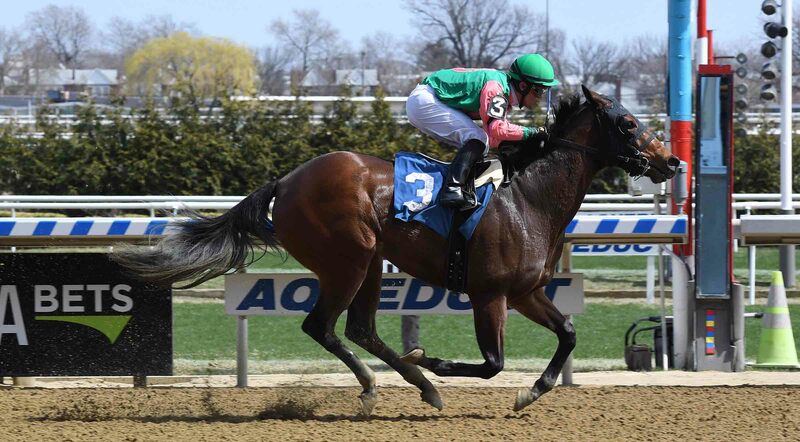 Benefitting from an ideal trip under Eric Cancel, co-owner/trainer David Donk, Suzanne Haslup and Sean Carney’s idle six-year-old New York-bred mare Eloweasel rolled to a two-length victory in a six-furlong $75,000 grass allowance Thursday at Aqueduct. Sent off at 5-2 odds from the rail in a field of nine, Eloweasel won in a final time of 1:08.61 on the “firm” outer turf course. Jimi Bags, who also went off at odds of 5-2 with Jose Lezcano riding, edged 6-1 gray Helen’s Tiger and Luis Reyes by a neck for second. Fox Ridge Farm bred Eloweasel, a daughter of City Zip out of A.P. Test by A.P. Indy who hadn’t raced since November 21st, when she finished second at 9-5 odds in an open turf allowance under John Velazquez. Credit Donk for having his filly read to go off a layoff of more than 4 ½ months. 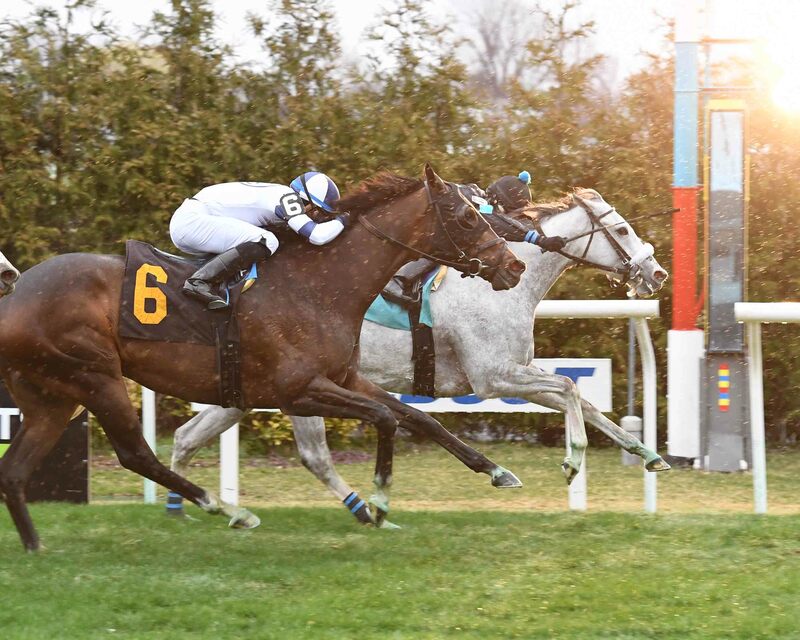 Cancel got Eloweasel forwardly placed early as 15-1 New York-bred Forgotten Hero and Mike Luzzi took the field to a blazing :21.78 first quarter-mile under pressure from 99-1 New York-bred Play Me a Memory and seven-pound apprentice Joey Martinez. Forgotten Hero maintained a slim edge by running a half-mile in a challenging :44.70. Eloweasel had been shuffled back to seventh, but rallied up the rail quickly into contention before Cancel angled her outside. Eloweasel split Forgotten Hero and a rallying Helen’s Tiger to take the lead. She finished strongly to win handily. Eloweasel is now four-for-25 on grass with four seconds and five thirds. She also one second from three dirt races, for combined earnings of more than $290,000. Racing for purse money only, Barry Schwartz and Andrew Rosen’s freshened three-year-old homebred colt Just Right shadowed front-running Trips Ups, took the lead immediately when asked by Manny Franco and blew the competition away, capturing a one-mile $66,000 New York-bred allowance/optional $75,000 claimer by eight lengths in a final time of 1:37.62. The late scratch of Just Right’s entrymate Beachside – when the entry was 4-5 on the toteboard – mandated that Just Right would race for purse money only. The gray Tiergan, sent off at 2-1 odds under Dylan Davis, finished second, a neck ahead of Bebe Banker, part of a 4-1 entry under Samuel Camacho Jr. Trips Up, who went off at odds of 8-1 under Kendrick Carmouche, finished just another nose back in fourth. Todd Pletcher trains Just Right, a son of Into Mischief out of Perfect Package by Tiznow who hadn’t raced since finishing seventh at 4-1 odds under Jose Lezcano in the $101,000 Rego Park Stakes on January 13th. Breaking from the outside post in a field of seven, Just Right settled in on the flank of Trips Up, who led by three-quarters of a length through splits of :23.22, :46.08 and 1:11.21. Then Franco let Just Right loose and he quickly took the front and opened up powerfully, winning easily without being asked late. Just Right is now three-for-eight with two seconds and more than $140,000 in earnings. 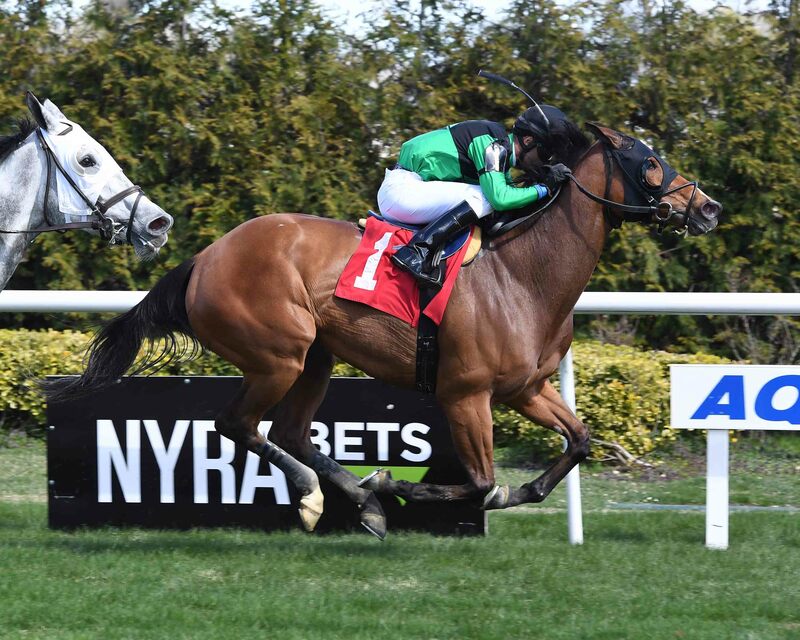 In a seven-furlong $50,000 New York-bred $25,000-$30,000 claimer for three-year-olds, Robbie Davis rallied Robert Bone’s gelding Fleet Warrior, the slight 2-1 favorite in a field of six, to a 3 ½-length victory in a final time of 1:25.50. Threatlovesmidnite, sent off at odds of 7-2 from the rail with Manny Franco aboard, finished second, three-quarters of a length ahead of Jack Bo, the 2-1 second choice ridden by Kendrick Carmouche. Big Mountain, who went off at 10-1 odds with Luis Reyes up, finished fourth, 6 ¼ lengths behind Jack Bo. Hibiscus Stable bred Fleet Warrior, a son of Bustin Stones out of Your Time Is Up by Freud who sold for $35,000 as a yearling in 2017 and is now trained by Rob Atras. Bone claimed Fleet Warrior for $30,000 on February 8th, when he won a maiden claimer by a half-length under Davis at 2-1 odds. 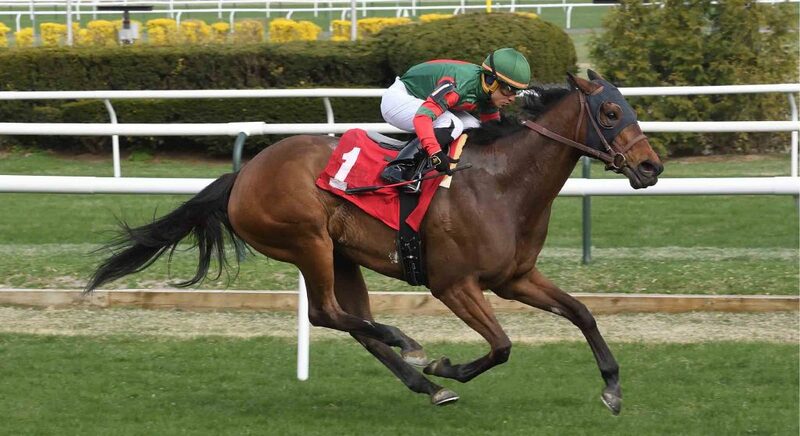 In his first start for his new connections on March 16th, Fleet Warrior and Davis finished second by three-quarters of a length in a New York-bred $32,000 claimer at 7-2 odds. Fleet Warrior broke sharply Thursday, but Davis conceded the early lead to Big Mountain. Fleet Warrior alternated in second and third with Jack Bo on his outside. Big Mountain led by one length after a first quarter in :22.93, then by just a neck as Jack Bo challenged him on the outside after a testing half-mile in :45.85. Jack Bo took the front as Fleet Warrior advanced quickly three-wide. Jack Bo led by a length past mid-stretch before Fleet Warrior rocketed past him and opened up impressively. Fleet Warrior is now two-for-five with one second and earnings topping $60,000. 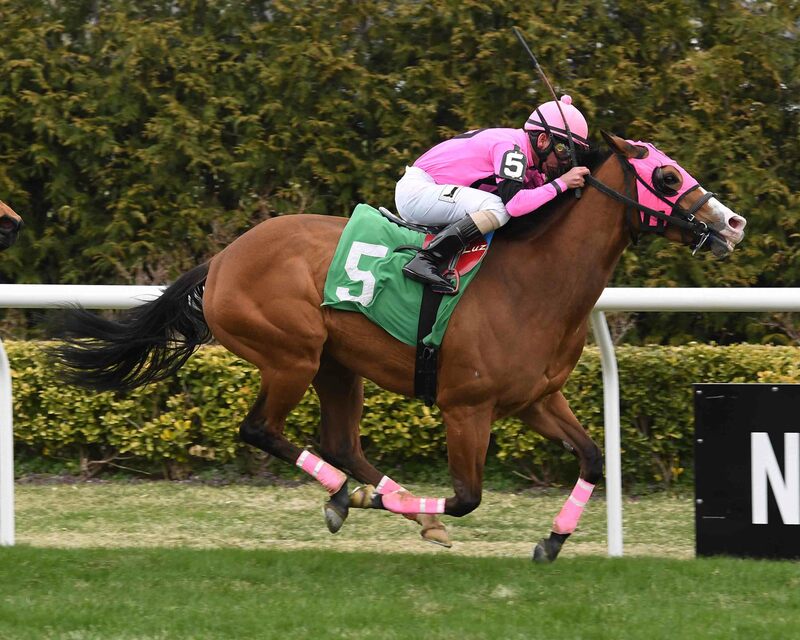 In Thursday’s finale, a six-furlong $41,000 New York-bred maiden $40,000 claimer on the grass, seven-pound apprentice Benjamin Hernandez rallied Say a Prayer Stable’s four-year-old homebred filly Roses From Ben to a neck victory. Sent off at 38-1 odds from the outside post in a field of 11 in his turf debut, Roses From Ben won in a final time of 1:09.93 on the “firm” outer turf course. My First Gal, who went off at odds of 5-2 under Joe Bravo, nipped 5-2 Kathy’s Cause and Dylan Davis by a head for second. Abby Normal, sent off at 13-1 odds under Manny Franco, finished fourth, just a neck behind Kathy’s Cause. Rodrigo Ubillo trains Roses From Ben, a daughter of Here Comes Ben out of Turf and Roses by Millions who was switching to turf off a much-improved third-place finish at 32-1 odds under Harrison on March 24th. Harrison got her away eighth on Thursday as 3-1 Wailin Josie and Eric Cancel set the pace under heavy pressure from 16-1 Seattle Frost and Kendrick Carmouche through a quick half-mile in :45.33. When the pacesetters tired, a huge pack of closers charged for the lead. The one moving fastest in deep stretch was Roses From Ben, who prevailed in a tight four-horse finish. Now one-for-one on turf and one-for-six on dirt with one third, Roses From Ben has earned more than $30,000. 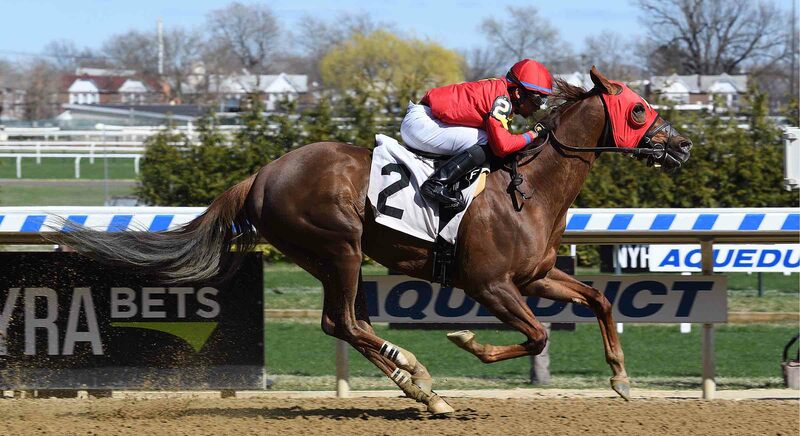 Red Storm Stable and Gerard Stuchbury’s five-year-old gelding Tribecca backed up his 3-5 odds under Manny Franco with a thoroughly professional 2 ¼-length coast-to-coast victory in a $70,000 New York-bred allowance/optional $40,000 claimer at Aqueduct Wednesday. Tribecca completed the six-furlong distance in 1:11.55. Candid Desire, sent off at odds of 6-1 from the outside post in a field of six under Eric Cancel, rallied to finish second, a half-length ahead of 12-1 Sicilia Mike and Dylan Davis. Five Star Bunt, who went off at 9-1 odds with Irad Ortiz Jr. up, finished just another head back in fourth. Laurel Least and Joseph Lech bred Tribecca, a son of Bustin Stones out of Heck by Heckle who is trained by Rudy Rodriguez. Tribecca was dropping back into state-bred company off a tiring fourth-place finish in an open $25,000 starter allowance under Franco on March 3rd. Breaking sharply from the two post, Tribecca took the led and Five Star Bunt settled in second. Tribecca led Five Star Bunt by two lengths after a :23.24 opening quarter-mile. Five Star Bunt narrowed the margin to one length after a half-mile in :47.19. Then Franco asked Tribecca for a little more and he spurted away through the stretch, winning handily. Tribecca improved his dirt record to six-for-24 with four seconds and four thirds. He has also raced four times on turf and has total earnings topping $340,000. 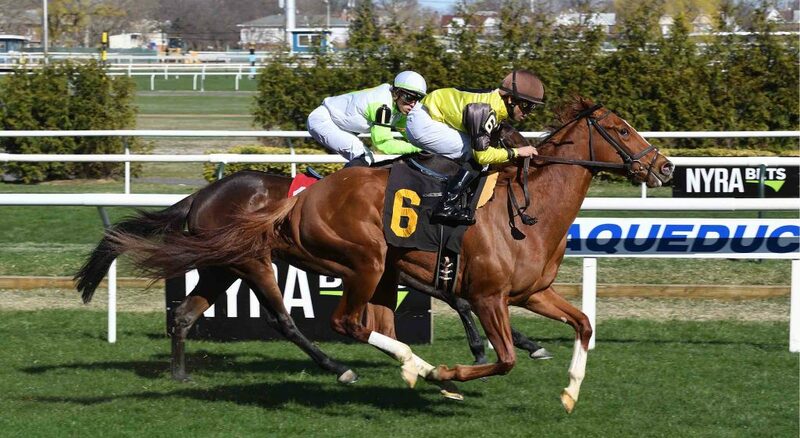 Everything Cricket Racing’s homebred Tzipi and Jose Lezcano nipped front-running Prisoner’s Dilemma and Irad Ortiz Jr. by neck in a six-furlong $62,000 New York-bred maiden special weight on the grass for three-year-old fillies Wednesday. Tzipi won in a final time of 1:10.66 on the “firm” outer turf course. Tzipi was sent off at 3-1 odds and Prisoner’s Dilemma went off at odds of 2-1 from the rail in a field of 11 reduced to nine with a pair of late scratches. Gunboat Diplomacy, a 16-1 shot piloted by Eric Cancel, finished third, 1 ¾ lengths behind Prisoner’s Dilemma while the same margin clear of 8-1 firster JJ Jen and Dylan Davis in fourth. Linda Rice trains Tzipi, a daughter of City Zip out of Ahvee’s Destiny by Rizzi who was making just her second career start after finishing fourth at 5-1 odds in her debut on dirt under Lezcano March 3rd. Lezcano got Tzipi away in mid-pack as Prisoner’s Dilemma and 2-1 Andretta, with Joe Bravo aboard, hooked up immediately on the front end. Prisoner’s Dilemma maintained a head lead on Andretta through a first quarter-mile in :23.11 and a half-mile in :46.31. Tzipi had rallied into third by then. When Prisoner’s Dilemma finally put away Andretta, she was immediately confronted by Tzipi. Prisoner’s Dilemma was tenacious, but Tzipi wore her down in the final 100 yards to win. With a win and a fourth to begin her career, Tzipi has earned more than $35,000. Beautifully rated on the front end by Kendrick Carmouche, Midwest Thoroughbreds’ five-year-old New York-bred mare Got the Gist captured her second straight race Wednesday, a mile-and-a-sixteenth $38,000 conditional $30,000 grass claimer, by three-quarters of a length in a final time of 1:43.18 on the “firm” inner turf course. Got the Gist was the 3-1 second choice on the rail in the field of nine. 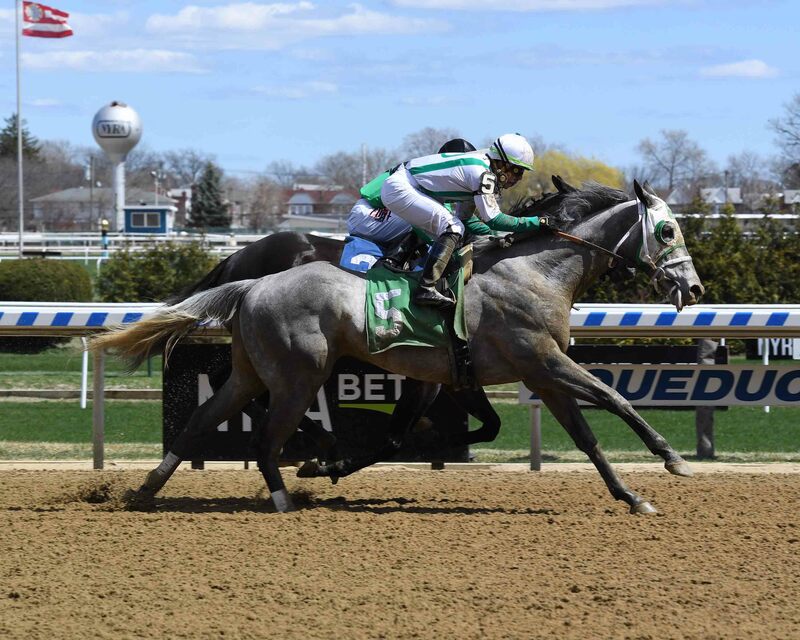 New York-bred gray Dynamite Kitten, the 6-5 favorite ridden by Junior Alvarado, ran a remarkable race to finish second despite blowing the clubhouse turn and racing on the far outside around the far turn. She just kept coming. New York-bred Laura’s Patriot, sent off at odds of 9-2 with Hector Diaz Jr. in the saddle, finished third, nearly three lengths behind Dynamite Kitten. Stacy Leppala bred Got the Gist, a daughter of Lookin At Lucky out of Wine Bar by Cuvee who was making her second start for trainer Danny Gargan after winning a maiden $25,000 claimer on dirt gate-to-wire by 4 ¼ lengths under Carmouche on March 15th. Got the Gist took the lead immediately and raced with a two- to three-length cushion through splits of :23.23, :48.42 and 1:12.55. Dynamite Kitten had rallied into second by then, and she closed in on the frontrunner, who held her safe to the finish line. Got the Gist is now one-for-four on grass with one third. She is also one-for-six on dirt with one second, for total earnings of more than $60,000. 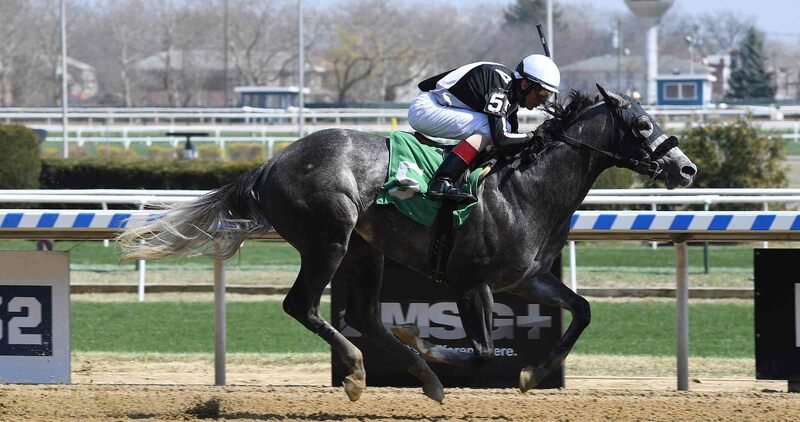 Rallying from way back under Joel Sone, ML Racing’s five-year-old gelding Fleet Irish got up in the final stride to edge front-running gray Big Thicket and Rajiv Maragh by a head Wednesday in a $46,000 New York-bred $25,000 claimer. He completed the one-mile distance in 1:40.65. Fleet Irish was sent off at odds of 10-1 and Big Thicket went off at 7-1 odds in the field of six. O Shea Can U See, sent off at 6-1 odds under Oscar Gomez, finished third, three lengths behind Big Thicket while 7 ½ lengths clear of You Tell Me, part of the 2-5 favorite entry under Kendrick Carmouche. Newtown Anner Stud bred Fleet Irish, a son of Dublin out of Mia’s First by Malabar Gold who is trained by Rachel Sells. Fleet Irish finished a distant fifth on a sloppy track under Harry Hernandez at 9-1 odds in his previous race on February 24th. Sone let him settle in a distant last as Big Thicket took the field to an opening quarter-mile in :24.21 and a half-mile in :47.77. Then You Tell Me and O Shea Can You nearly reached even terms with Big Thicket while racing two- and three-wide, respectively. By then Fleet Irish had advanced into fourth on the far outside. Big Thicket was absolutely game, holding on to a narrow lead as Fleet Irish arrived on the scene on the far outside. Fleet Irish and Big Thicket hit the finish line in near-tandem, with the photo revealing Fleet Irish a nose winner. Fleet Irish is now six-for-26 with four seconds, three thirds and career earnings of more than $255,000. 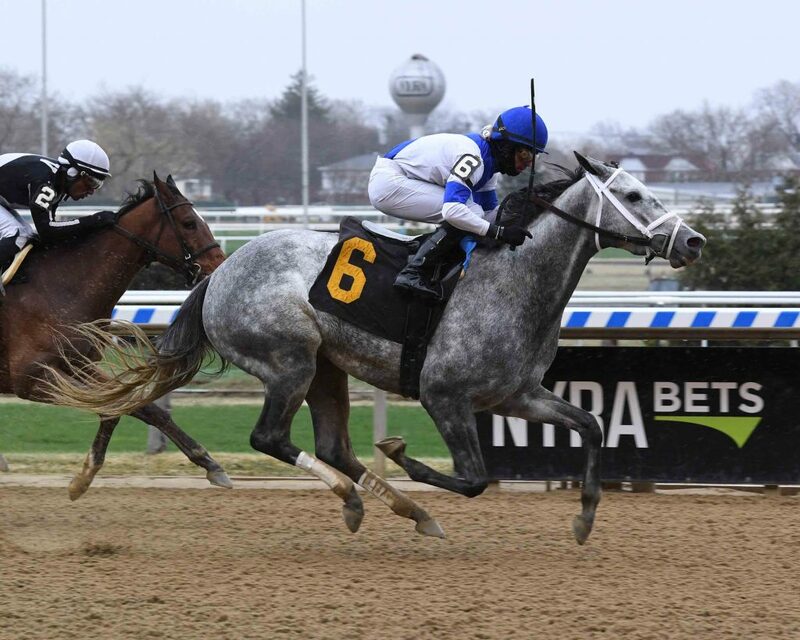 With a perfectly timed, furious rally from last under Irad Ortiz Jr., Edition Farm’s homebred, the New York-bred gray gelding Local Edition, ran down front-running favorite New York-bred There He Goes to win a $28,000 conditional $16,000 claimer by a neck to give Ortiz a sweep of Wednesday’s daily double. He completed the one-mile distance in 1:41.07. Local Edition was sent off at odds of 11-1 and There He Goes, with Junior Alvarado up, was the even-money favorite in the field of six. New York-bred There Goes Jose, the 2-1 second choice on the rail ridden by seven-pound apprentice Joey Martinez, finished a distant third, 8 ¼ lengths behind There He Goes. Rick Schosberg trains Local Edition, a son of Cosmonaut out of Miney’s Awesome by Awesome Again who finished a tiring, distant fifth on a sloppy track at 12-1 odds under Eric Cancel in his previous start on March 10th. Riding Local Edition for the first time, Ortiz let him dawdle in last as There He Goes set the pace under light pressure from 5-2 Metaphorical and Manny Franco through an opening quarter-mile in :24.00 and a half-mile in :48.20. Ortiz sent Local Edition up four-wide around the far turn while There He Goes put away Metaphorical, hitting three-quarters in 1:14.11 with an expanding lead as Local Edition advanced into second. There He Goes stretched his cushion to more than five lengths in mid-stretch. There He Goes was still three lengths ahead at the sixteenth pole, but Local Edition gobbled up the ground separating them and nailed him in the final frantic yards. Local Edition is now two-for-seven on dirt with one second and nearly $50,000 in earnings. 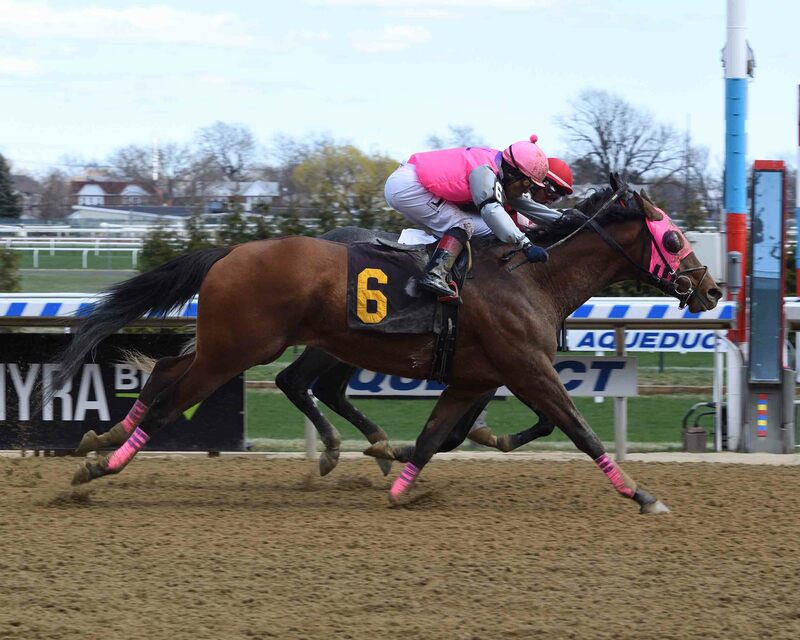 In a six-furlong $28,000 conditional $16,000 claimer, Fortune Farm’s freshened four-year-old New York-bred filly My Victoria Rose struck the lead in early stretch under Junior Alvarado, opened a five-length lead and won in-hand by 3 ¼ lengths. Sent off as the 9-5 second choice from the nine post in a field of 10, My Victoria Rose won in a final time of 1:13.68. 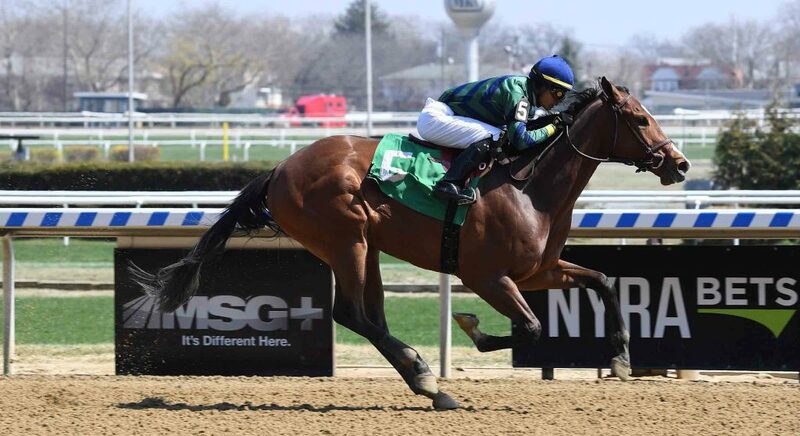 New York-bred Simona, the 3-2 favorite ridden by Manny Franco, finished second, a half-length ahead of 14-1 New York-bred Viradia and Reylu Gutierrez. Front-running New York-bred Itsjustnotyourday, who went off at odds of 17-1 under Samuel Camacho Jr., finished fourth, 4 ¼ lengths behind Viradia. Richard Nicolai bred My Victoria Rose, a daughter of Girolamo out of Democrat Taxes by Catienus who is trained by Jeremiah Englehart. My Victoria Rose was freshened off a fourth-place finish at 4-1 odds on January 18th in an open $50,000 starter allowance. The drop in class was duly noted by bettors Wednesday. Alvarado got her away fourth as Itsjustnotyourday took the field to a fast first quarter-mile in :22.98 and a half-mile in :47.49. Itsjustnotyourday had no answer when My Victoria Rose came charging at her on the outside. My Victoria Rose opened up impressively and won easily without being asked late. My Victoria Rose is now two-for-six on dirt with one second and one third. She’s also raced twice on turf and has combined earnings of more than $60,000. 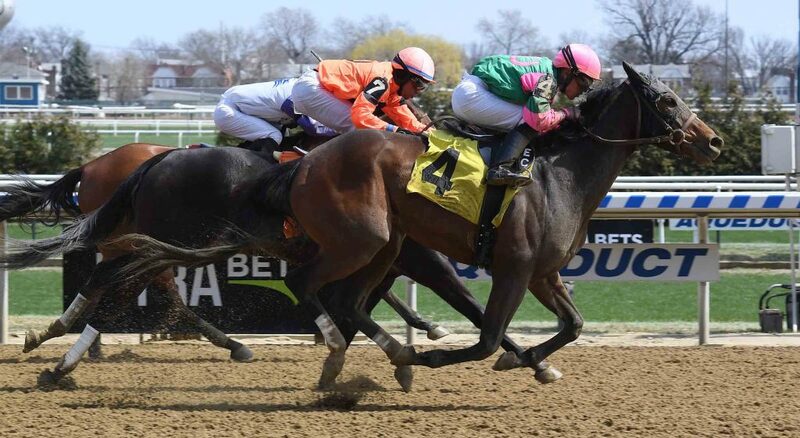 Beautifully rated on the front end by Mike Luzzi, Flying P Stable’s four-year-old New York-bred filly Vip Nation, who won her turf debut under David Cohen at 62-1 odds a year ago, did it again Sunday at Aqueduct, taking a mile-and-a-sixteenth $75,000 grass allowance by one length at odds of 64-1. Vip Nation won in a final time of 1:41.95 on the “firm” course. Call Me Kayla, sent off at odds of 17-1 with Kendrick Carmouche riding, finished second, a head clear of Too Cool to Dance, the even-money favorite in the field of eight ridden by Manny Franco. JD Stuart, PC Bance and AR Enterprises bred Vip Nation, a daughter of Paynter out of Sweet N Sour Nina by Sweetsouthernsaint who is trained by Michael Tannuzzo. 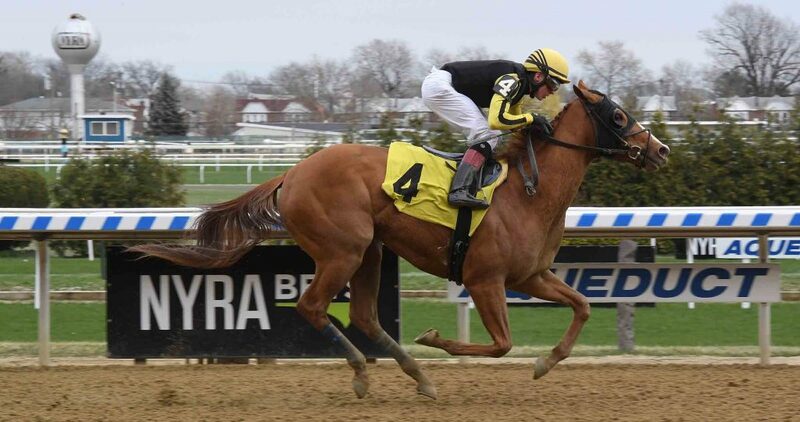 Vip Nation was returning to grass and stretching out off a fifth-place finish at 18-1 odds under Eric Cancel in a six-furlong New York-bred allowance/optional $40,000 claimer on March 8th. She broke sharply Sunday and secured the lead immediately by one length. Luzzi doled out her speed and she led by a length to two lengths through splits of :24.02, :49.00 and 1:12.94. Call Me Kayla was trying to rally two-wide with Too Cool to Dance right next to her three-wide trying to get to Vip Nation, but she held on strongly and won, returning $130.50 for a $2 win ticket. Vip Nation is now two-for-five with one second on grass. She is also two-for-13 on dirt with six thirds, for combined earnings of just under $200,000. 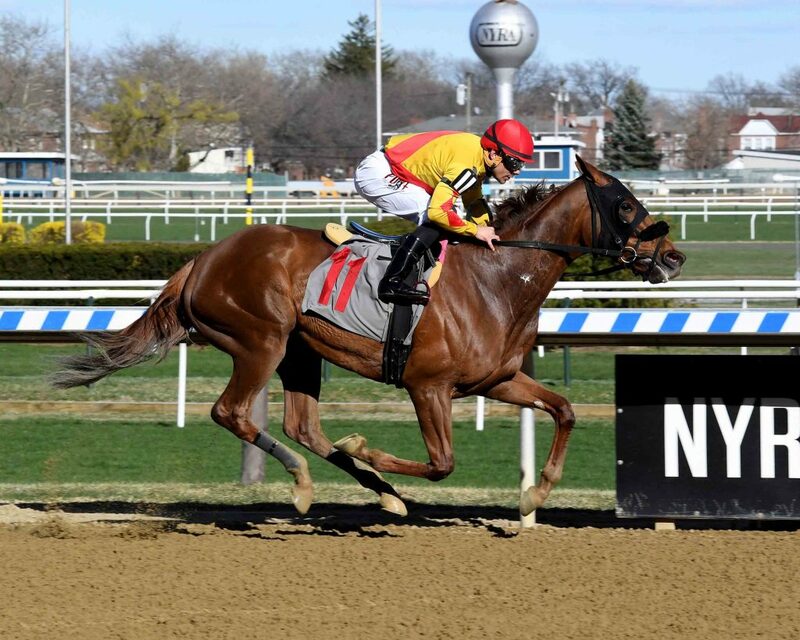 Robert Valeri’s freshened homebred Big Brown Cat broke on the lead under seven-pound apprentice Benjamin Hernandez and never had an anxious moment, taking a six-furlong $50,000 New York-bred $25,000-$30,000 claimer for three-year-old fillies by five lengths for her second consecutive victory. Sent off at 2-1 odds in the field of just four, Big Brown Cat won in a final time of 1:13.16. Infatuation, sent off at odds of 3-1 under Eric Cancel, finished a clear second, two lengths ahead of 2-1 No Stone Unturned and Adrian Flores. Pennys From Heaven, the 8-5 favorite on the rail under Junior Alvarado, was never involved. Gary Gullo trains Big Brown Cat, a daughter of Big Brown out of Cat Ferrad by Stormy Atlantic who won an open maiden $30,000 claimer by 4 ¾ lengths under Reylu Gutierrez on February 15th. Gullo gave her plenty of time to recover from that effort, and she returned running. She pounced on her rivals Sunday, taking an immediate one-length lead. She stretched the cushion to two lengths through a :22.80 first quarter-mile, then opened a five-length gap by running a half-mile in :46.32. She was six lengths clear past mid-stretch and cruised home as much the best. Big Brown Cat is now two-for-seven on dirt with one third and earnings topping $55,000. In Sunday’s finale, a six-furlong $35,000 New York-bred maiden $25,000-$30,000 claimer for three-year-old fillies, Eric Cancel rallied Amanda Laderer, Paul Morongello, Martin Fox, Mark Gonzalez and Janet Hirsch’s Queendom, who was adding blinkers, from last to a length-and-a-half victory. Sent off at 7-2 odds from the 10 post in a field of 12, Queendom won in a final time of 1:13.93, giving Cancel, who won Sunday’s opener, a riding double. Little Big Risk, who was also adding blinkers and went off at 14-1 odds under Andre Worrie, edged 9-1 Street Chamber and seven-pound apprentice Benjamin Hernandez by a neck for second. There was a length-and-three-quarter gap back to 3-1 Tousled and Kendrick Carmouche in fourth. St. Elias Stable bred Queendom, a daughter of Freedom Child out of Evil Queen by Hear No Evil who sold for $15,000 as a two-year-old in May 2018 and is trained by Carlos Martin. Queendom was making just her third career start after finishing sixth in a maiden special weight and a distant fifth in a maiden $30,000 claimer. Pablo Fragoso was the jockey in both starts. Cancel let Queendom settle in last early, far off a five-wide stampede for the early lead. Tousled and 12-1 Charming Cara, ridden by Reylu Gutierrez, emerged from the speed pack with Charming Cara hitting the front after a fast first-quarter mile in :22.77. Charming Cara stretched her lead to two lengths by running a half-mile in :46.63. Queendom was 12th at that point, but began a powerful rally around the far turn. When Charming Cara tired, Tousled took the lead, but the pack was closing in quickly. Down the center of the track on the far outside, Queendom was flying fastest of all, and she won going away. 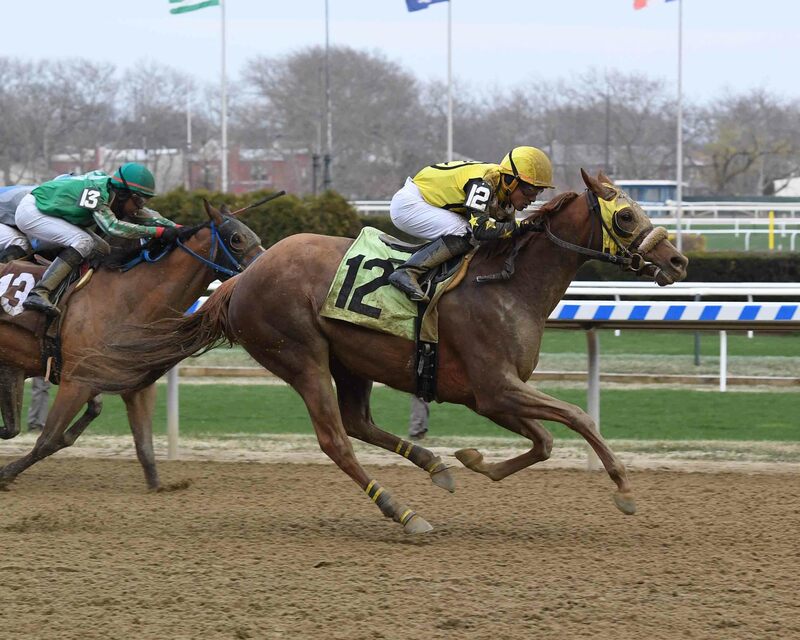 Funky Munky Stable’s Flat Out Funky kicked into gear in mid-stretch and ran down odds-on front-running First Forever to win Sunday’s opener, a one-mile $33,000 New York-bred maiden $25,000 claimer for three-year-old fillies, by a neck under Eric Cancel. Flat Out Funky was sent off at odds of 10-1 and First Forever was the 3-5 favorite from the outside post in the field of seven with Manny Franco up. Causin’ Trouble, sent off at odds of 4-1 from the rail under seven-pound apprentice Benjamin Hernandez, finished third, just a neck behind First Forever. Miss Flambe, who went off at 5-1 odds with Kendrick Carmouche aboard, finished another three lengths back in fourth. Jack Liebeau bred Flat Out Flunky, a daughter of Flat Out out of From Tiz Moment On by Tiznow who sold for $25,000 as a yearling in October 2017 and is trained by David Donk. Flay Out Funky finished a distant third under Cancel at 12-1 odds in a maiden $30,000 claimer on March 17th in her prior start, her third consecutive third-place finish. Cancel got Flat Out Funky away fourth Sunday as First Forever took the lead and Miss Flambe chased in second through an opening quarter-mile in :24.51 and a half-mile in :49.21. Then Miss Flambe drew closer as Cancel sent Flat Out Funky up three-wide around the far turn and Causin’ Trouble advanced on the rail. When First Forever put away Miss Flambe, she had to deal with Flat Out Funky on the outside and Causin’ Trouble on the inside. First Forever was tough, but couldn’t hold off Flat Out Flunky in the final 200 yards. Flat Out Funky is now one-for-six on dirt with three thirds and earnings of more than $30,000. Roddy Valente’s homebred gray colt Stone Breaker broke last under John Velazquez, drifted out a bit after taking the lead in mid-stretch and then hit another gear, accelerating to his third straight victory by 4 ¼ lengths as the 1-5 favorite in a field of five contesting a six-furlong $66,000 New York-bred allowance/optional $75,000 claimer Saturday at Aqueduct. Stone Breaker won in a final time of 1:11.03. Front-running Oh My Papa, sent off at odds of 4-1 with Junior Alvarado aboard, held for second, a length ahead of 9-1 The Big Lebanese and Dylan Davis. Trance, who went off at 16-1 odds under Rajiv Maragh, finished another three lengths back in fourth. Gary Gullo trains Stone Breaker, a son of Eskendereya out of Stone Maker by Empire Maker. After finishing a front-running second by a half-length at 19-1 odds in his debut on November 29th, Stone Breaker won a maiden special weight by 6 ¼ lengths at even money and an allowance race/optional $75,000 claimer by 4 ¼ lengths at 3-1 odds. He broke a step slow in last under Velazquez, who was riding Stone Breaker for the first time. Velazquez then rushed him into second on the outside of Oh My Papa, who led by a length through an opening quarter-mile in :22.65. Stone Breaker drew even with the frontrunner, then struck the lead after a half-mile in :45.83. He drifted out a bit, but then leveled off beautifully and powered home to another victory. With three wins and a second in his first four starts, Stone Breaker has already earned more than $100,000. Delivering a “wow” performance in her debut Saturday, Off the Hook LLC’s homebred Flashpackinbarbie stalked front-running Awillaway and Andre Worrie, took over when asked by Jose Ortiz and drew away to an 8 ¼-length victory in a $62,000 New York-bred maiden special weight for three-year-old fillies. She covered the five and a half furlongs in 1:04.95. Flashpackinbarbie was the 2-1 favorite and Awillaway was sent off at odds of 9-1 in the field of nine. She’s Not Bluffing, who was adding Lasix and blinkers and went off at 5-2 odds from the rail with Manny Franco up, rallied to finish second, a half-length ahead of 12-1 Irish Banker and Herman Harkie. Awillaway, sent off at 9-1 odds, salvaged fourth, another three lengths back. Jorge Abreu trains Flashpackinbarbie, a daughter of Munnings out of Mighty Eros by Freud who signaled her intentions with a bullet five-furlong work in 1:01 4/5 and, in her last drill, four furlongs in a sharp :48 2/5. Ortiz set her up beautifully on the flank of Awillaway, who led by a half-length through a first-quarter in :22.28. Flashpackinbarbie drew closer around the far turn, took over and then took off, leaving the others way behind in an impressive performance. Barreling down the center of the track, Peter Deutsch’s five-year-old gray mare Spring Drama rolled to a one-length victory in a 6 ½-furlong $66,000 New York-bred allowance race at Aqueduct Friday, giving jockey Jose Lezcano his second win of the afternoon. Sent off the 8-5 favorite in a field of seven, Spring Drama won in a final time of 1:19.49. Miss Hot Stones, who went off at odds of 5-1 with Rajiv Maragh aboard, finished second, a length and a quarter ahead of fast-finishing 6-1 Passporttovictory and Reylu Gutierrez. She’s Trouble, the 2-1 gray second choice on the rail ridden by Irad Ortiz Jr., finished just another nose back in fourth. Nancy Harris, John Allen and Christina Nunn bred Spring Drama, a daughter of Big Drama out of One Spring Storm by Wekiva Springs who is trained by Kiaran McLaughlin. Spring Drama finished second by a head under Lezcano in her previous start at 3-5 odds on March 2nd. On Friday, Lezcano settled his mare in third as 46-1 Cryinthemoonlight and Andre Worrie set the pace with Miss Hot Stones chasing more than a length behind in second through an opening quarter-mile in :23.65 and a half-mile in :47.76. When Cryinthemoonlight stopped, Spring Drama came flying on the far outside as She’s Trouble got through on the inside. Spring Drama sustained her momentum and got the job done. Spring Drama improved her dirt record to two-for-four with two seconds. She also has two seconds and a pair of thirds from seven turf tries, for combined earnings of more than $110,000. 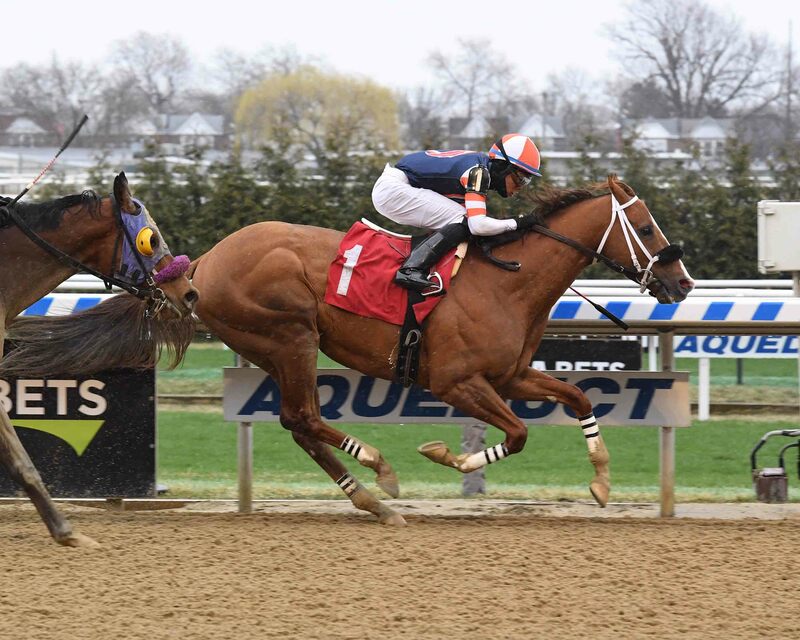 Co-owner/breeder/trainer Michelle Nevin and Little Red Feather Racing Stable’s four-year-old colt Charlie McCoy made it look easy Friday, winning a one-mile $70,000 New York-bred allowance/optional $40,000 claimer wire-to-wire on the rail by three-quarters of a length, giving jockey Manny Franco his second of three consecutive winners on the card. Sent off the 6-5 favorite in a field of seven, Charlie McCoy won in a final time of 1:38.30. Carthon, who went off at odds of 5-2 with Irad Ortiz Jr. up, finished second, 1 ¾ lengths clear of 12-1 Blugrascat’s Smile and Rajiv Maragh. There was a two-length gap back to 7-1 Three to Thirteen and Dylan Davis in fourth. Charlie McCoy, a son of Bluegrass Cat out of Backslash by Sharp Humor, finished second under Jose Lezcano at 4-5 odds in his previous start on February 23rd. Franco hustled Charlie McCoy to the lead Friday, and he had to work to keep a head in front of Three to Thirteen through a :23.86 first quarter-mile. Charlie McCoy edged away to lead by a half-length through a half-mile in :47.80 and three-quarters of a mile in 1:12.38. When he put away Three to Thirteen, Charlie McCoy had a new challenger in Carthon, but he held him safe to the wire. Charlie McCoy is now three-for-eight with three thirds and earnings of nearly $160,000. In Friday’s finale, a one-mile $62,000 New York-bred maiden special weight on the grass, Spendthrift Racing Stable’s four-year-old gray filly Anne’s Song, shedding blinkers in her turf debut under Kendrick Carmouche, rallied on the rail to edge Star of the East and Manny Franco by a head. Anne’s Song was sent off at odds of 7-1 and Star of the East was the 8-5 favorite in the field of 11. Sterling Beauty, who went off at odds of 13-1 from the rail with Eric Cancel up, finished third, three-quarters of a length behind Star of the East while a length ahead of 5-1 Recess and Junior Alvarado. Elena Ahlschwede bred Anne’s Song, a daughter of Emcee out of Annie Roe by Lightnin N Thunder who sold for $16,000 in 2016 and is trained by Carlos Martin. Anne’s Song had two seconds and five thirds in her previous seven starts. Carmouche got her away second as 9-5 Lough Na Mona and Irad Ortiz Jr. took the field through splits of :23.42, :49.09 and 1:13.31. When Lough Na Mona tired, Anne’s Song got through on her inside as Star of the East rallied on the outside. Anne’s Song prevailed narrowly in a final time of 1:37.94. Now one-for-one on grass, Anne’s Song has four seconds and six thirds from 15 dirt starts, for total earnings of more than $120,000. Very Nice feature … it would be nice to expand and cover the NY Breds at Finger Lakes as well.